36 Questions that Changed My Mind About You is a romantic comedy style book. With a failed meet-cute of Betty and Bob who meet through a psychology study. They are both there for different reasons, one to find love or at least something like it and the other who has no idea what he’s in for, he just needs the money from the study. Opposites attract in this strange and cute story. It goes through the main character Betty/Hildy’s point of view for most of the novel and her journey to the university and to this study of human connections. It’s about finding yourself, and has a lot of truth and honesty, even when the characters are trying their hardest to keep their true selves a secret and separate from the other, who is a virtual stranger. They may even know more about each other than their friends do. First impressions aren’t always as they seem, not everyone shows you who they really are upon first meeting, but maybe that can change, once you get to know someone, even a stranger. The story was overall light and a quick read, however I found the character development a little lacking especially in main character Betty/Hildy. However, Bob/Paul was a unique character different from most books, especially surprising for this genre. It was an enjoyable read but somethings I found a little unrealistic, and I felt the ending was a little abrupt. Also, the story was slightly repetitive at times, but that may have been the nature of the book and the repetitive vibe the psychology study gave. I would still recommend this book to readers who enjoy romantic comedies and meet-cutes. –Zoe P.
In a world plagued by zombies, Benny Imura is a resident of one of the few fenced communities that offers protection from the hellish world beyond. The community insists that upon turning 15, all its citizens must find work. After months of searching for an easy sounding job, Benny begrudgingly accepts an apprenticeship with his annoyingly righteous older brother, Tom. A respected and honourable zombie hunter, Tom seems to have gained everyone’s admiration except Benny’s. In hopes of teaching him the ways of hunting, he eagerly hires Benny and starts his training. Benny does not expect much from this job or his brother for that matter, but what he discovers beyond the fence reveals things that challenge what he thought true, and teaches him valuable lessons on humanity and himself. Rot and Ruin not only contained fast paced action, but was also a coming-of -age story that through the story of a boy in a post apocalyptic world, made you think about the real monsters in life — us. Personally I loved this book and the way it combined brutal zombie killing action with real life lessons that can be applied out of the zombie apocalypse context. It was full of heart and taught the importance of family, friends, and love. Combined with Jonathan Maberry’s writing style and the surprises that always lurked around the corner, this novel never had a dull moment. An undoubtedly riveting read, I recommend it to any zombie fan or anybody wanting a truly heartfelt book. –Fiorella M.
The book A Long Way Gone is an exciting nonfiction story about the life of Ishmael Beah during the civil war in Sierra Leone. With this book being a nonfiction story the entirety of its contents are all from the author Ishmael Beah. The book starts out with Ishmael leaving his village with his brother and friends to go to a talent show. They plan to perform a rap song that they found while watching TV. When they reach the town, things do not go as planned as the RUF (the rebels) attack the town and send all of its inhabitants in every direction. Ishmael does meet up with his brother and friends and continues to travel from town to town to look for his father, but eventually Ishmael Beah is forced to become a child soldier. A Long Way Gone portrays loss and discovery in amazing and clear detail. From simple scenery to the most sentimental of moments, this book focuses mainly on Ishmael Beah and his struggle with being forced to become a child soldier and how his redemption and eventual reintroduction to society goes. Ishmael Beah did a great job by writing this book and releasing it in a way that both children and adults alike can relate to the stresses and situations portrayed. If you want a great quick read with only twenty one chapters, that will leave you satisfied, then this is the book choice for you. – Michael S.
The Pursuit of Happyness is a film directed by Gabriele Muccino and was created in 2006. The film stars world-renowned actor Will Smith as he takes on the role of a struggling, single father, Chris Gardner. Inspired by the true story, the film depicts the life of a San Francisco salesmen who struggles to make a future for himself, as he is accompanied by his 5 year-old son whom he has to take care of. Chris’s determination pays off when he lands an unpaid internship in a brutally competitive stockbroker-training program, where only one in twenty interns will make the cut. But without a salary, Chris and his son are evicted from their apartment and are forced to sleep on the streets, in homeless shelters and even behind the locked doors of a metro station bathroom. This heartwarming yet saddening film shows the hardships that Chris must overcome in order to ensure his and his son’s survival. This eventually leads him to become a Wall Street legend. Having seen this movie on numerous occasions, it has become a personal favourite. Films such as this one, often leave the audience motivated and humbled when they witness individuals overcome everyday conflicts that many endure. In society, the reality of many being financially unstable and deprived is often sugar-coated, but this film will definitely pull on a few of our heart strings. Will Smith’s performance makes the film even better as he and his biological son, who is also in the film, depict the life of many broken families who are able to tackle issues together. Parents are able to relate to this as they will do anything to provide their children with a successful life. 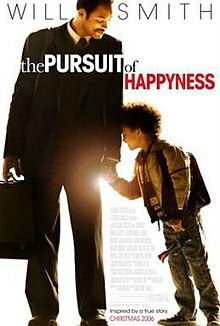 The Pursuit of Happyness should definitely be on everyone’s ‘To Watch’ lists as this one will not disappoint. –Iffat A.
Nineteen years after the Battle of Hogwarts, we take a glimpse into the wizarding world and the life of Harry Potter and his family. This story is based on the play that is showcased in London and New York, and as a result, is written as a script. Harry Potter is now a hardworking employee of the Minister of Magic, a husband, and the father of three children. It’s not easy being the son of a legend, especially when that legend is Harry Potter himself. Harry and Ginny’s youngest son, Albus, is attending Hogwarts this year with the weight of a legacy he never asked for. Join Harry in his son while they form a unique father and son bond. Watch history repeat itself as you stroll back to the school which once was Harry’s. Filled with old favourites like Hermione, Ron, Draco, and McGonagall this script is sure to revive some old memories of magic. Harry and Albus are both forced to learn that darkness and evil and arise from the most unsuspecting places. The Cursed Child is an amazing read, especially if you have fallen in love with the world of Harry Potter. It is not formatted like the rest of the series, however, if you are able to get past that, then I definitely recommend this book. Enter this magically world one more time with Harry Potter and the Cursed Child. Action, suspense, and mystery fill the pages of this book, and J. K. Rowling keeps you on edge with her exciting new installment of Harry Potter. -Ananya M.
Coda is one of the seven books part of the Seven Sequels to Seven, The Series. Read the seven books in any order you like and join a different grandson in each of the stories. In the sequels, while the grandsons are heading up to their grandfather’s cottage, they find shocking evidence that suggests that their beloved grandfather could have been a spy, or worse, a traitor. With multiple fake passports, cash and a gun found in a secret compartment each of the grandsons set off on their own journey. Spencer’s world is turned upside when his brother is kidnapped. In order to find him, Spencer and his friend AmberLea and an annoying accomplice, Toby, must join together before something happens to his brother, Bunny. Together they face savage crocodiles, a murder mystery involving his grandfather, and kidnappers trying to capture them. Through all this, Spencer finds out shocking truths about his grandfather’s actions in the past and that his grandfather might have been the reason that Bunny was kidnapped. Who was David McLean really? Spy or Traitor? Action, drama, love, emotions, suspense and adventure, this book is a complete package. The chapters of this book are filled with amazing ideas and an intriguing plot line. If you enjoy mystery books, then this is a book that is perfect for you. Ted Staunton does a fantastic job bringing his story to life in the eyes of the reader. This book defines the true meaning of family and being there for one another, always. Join Spencer and the other grandsons as they try to uncover the past by risking their own future. Sleeper is the sequel to Eric Walter’s coming of age novel, Between Heaven and Earth. Sleeper is one of the seven sequels to Seven, The Series. Read the seven books in any order you like and join a different grandson in each of the stories. In this book follow DJ and his cousins as they chase the mysteries of their grandfather’s past and join them in uncovering the truth. DJ, who is very proud of being seen as a younger version of his grandfather, hence the name David Junior, is shocked when he finds fake passports, bundles of cash in foreign currencies, and a gun in a secret compartment in his grandfather’s cottage. DJ finds himself thousands of kilometres away, racing a vintage E-Type Jag around London, England! And then there’s Charlie, the gorgeous granddaughter of DJ’s climbing partner, from the book Between Heaven and Earth, who joins DJ as his tour guide, but she gets swept into all of DJ’s missions as well. With double and triple agents, spies, guns, M16 agents, and traitors around every corner, can DJ discover the truth about his favourite person? Spy or a traitor? Who was David McLean really? Sleeper is a phenomenal book by Eric Walters, and it is one that you will thoroughly enjoy. Although you can read the seven sequels in any order you choose, I recommend reading Sleeper first, as it provides the most background information and starts with the scene at the cottage. This thrilling book is filled with suspense, action and excitement. Join DJ, Carlie, and the double agents seeking up behind them, as they enter the thrilling world of British espionage. -Ananya M.
Between Heaven and Earth is a book part of Seven, The Series. These are the stories of seven grandsons and their quests, which have been given to them by their lawyer after their grandfather’s death. They each must complete their challenge and must not reveal it to anyone else but their fellow cousins. In Eric Walters’s Between Heaven and Earth, we join 18-year-old DJ in climbing Mt. Kilimanjaro and scattering his grandfather’s ashes at the top. DJ has always been perfect at sports, a true leader and on top of his game, so he thinks that a small hike up a mountain is easy. But what really bugs him is that he gets stuck with an inexperienced porter and an old lady in his climbing group. He thinks that at this rate he’ll never reach the top. And what’s worse is that his stuff was stolen. Fast-paced DJ must learn that sometimes you have to go “pole pole” (slowly slowly). This is a beautiful coming of age book in which we can really see the characters develop. DJ is shaped by the lessons he learns, the people he meets, and the challenges he has to face. Learn important lessons along with DJ while he tries to climb a mountain that his grandfather did himself. This book has action, adventure, drama, and a sense of family. It is a perfect book for teens as it teaches them to slow down once in a while and not to judge people by their appearances. Eric Walter does an amazing job of conveying his story and leaves us searching for answers. Will DJ reach the top? -Ananya M.
The Elite is the sequel to Kiera Cass’s daring novel, The Selection. The Elite has been chosen, and the selection is now down to only six girls, with Lady America Singer being Prince Maxon’s obvious favourite. But it doesn’t seem that way with everyone else. The King and Queen have different opinions, and they don’t approve of such strong-willed behaviour. What’s even more difficult for America is now that she’s started to fall for Maxon, she has to see Aspen on guard every day. Does she still have feelings for Aspen? America is faced with new challenges, each that are preparing her and the elite to become stronger and better queens. But America doesn’t feel she has what it take and is worthy enough to be fit for the position. As distance grows between America and Maxon, she gets closer to Aspen, and the question arises, does she really want to be here, is this how she wants to spend her life?! America’s connect with her family is now stronger, even with her mom. With attacks, by both north and south, rebels becoming more and more frequent around the castle, the safety of everyone is put into question. Find out what disturbing secrets the walls of the kingdom is hiding. The Elite is a fabulous book by Kiera Cass, this story is not your classic fairytale. Shocking surprises that aren’t always pleasant fill every chapter. Suspense, love, friendship, action, family, and drama this book has it all. Join America on her quest of love and find out mysterious truths along the way. -Ananya M.
Every girl in the kingdom would give anything to marry the charming Prince Maxon, except for America Singer. The kingdom is ruled by a caste system, and her family is only three from the bottom, she’s a five. They know they don’t have it the worst, but they have seen some pretty bad days, terrible pay, seasonal work, and periods of time where they have to go hungry, but she is still happy. When the selection roles around America is reluctant to enter, even if there is there is barely any chance that she would be drawn as one of the 35 girls that would live in the palace and fight for the hand of Prince Maxon in marriage. The reason she can’t go is because of her loving boyfriend, Aspen, a six. After constant pressure from her family and boyfriend she enters the selection, and miraculously she is drawn as one of the selected. Now it’s up to America to prevent her being chosen as the princess so she can come back and marry her boyfriend. That’s not all that easy when the Prince at hand is as charming as Prince Maxon. Fall in love with the selection series and America Singer as you follow her story from a shabby little treehouse to the steps of the palace itself. Kiera Cass does an amazing job portraying the story and helps you form a real connection with most of the characters. I had some trouble forming a connection with the character of Aspen as he seemed a little distant, however it was not enough for me to give it any fewer stars or to change my opinion about the book. Overall a thoroughly enjoyed the book at definitely recommend it to others. -Ananya M.